ohiooddities has no other items for sale. Details about MLB Philadelphia Phillies Baseball Fancy Tie in Gift Box - NEW! 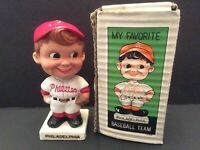 MLB Philadelphia Phillies Baseball Fancy Tie in Gift Box - NEW! Chase Utley Philadelphia Phillies 2008 Bobblehead Toyota SGA!